Lighting makes up approximately 20% of the total electricity use in the US of which 15% is solely from household electricity use. The typical household still uses incandescent light bulbs, spending about $110 per year on lighting bills. Use of compact fluorescent light (CFL) can reduce this expense markedly. How is light produced in CFLs? CFL bulbs emit light that is a mixture of three phosphors exposed to ultraviolet light produced by mercury atoms. This process is unlike incandescent bulbs, which use filaments. Though CFLs cost more at the onset, they are tested to provide 8,000 hours of light as against the 500-2,000 hours from incandescent bulbs. This translates to about $36-45 of savings per CFL. Here is the math—an 18-watt CFL costing $15-20 saves you from purchasing ten ordinary 75-watt incandescent bulbs. Why are CFLs more cost-efficient than incandescent bulbs? Incandescent bulbs manage to convert only 10% of electricity to visible light, with the remaining 90% converting to heat. Hence, using more efficient lighting can substantially curtail electricity consumption. Replacing the commonly used incandescent bulbs with CFLs is expected to cut electricity use for lighting by half, further reducing the annual carbon dioxide emissions by about 125 billion pounds. CFLs can be used in various types of light fixtures like table lamps, ceiling lights, spotlights, etc. and they come in a variety of styles too. Twin Tube Lamps have two tubes in the lamp, aligned in a parallel manner. Also called Biax or Dulux, they fit into lamps, recessed ceiling lights, and wall lights. Quad Tube Lamps are the same as twin tubes of similar wattage at half the length. These bulbs fit better in smaller fixtures like lamps. They are also called double Biax, PL Clusters or PLC lamps. Triple Biax Lamps generate more light in a shorter body. Providing a high amount of light output in a small-sized bulb shape, they easily fit into fixtures meant for incandescent bulbs. Spiral Lamps are a spirally-shaped continuous tube lamp. In shape and light output qualities, it equals a standard incandescent bulb. Therefore, it is the most popular model of CFLs. F lamps are similar to quad tubes except that their two tubes are aligned from top to bottom instead of side to side. Therefore, the shape resembles an F. They are frequently used as task lights and in low-profile recessed fixtures. Circular (Circline) lamps are usually designed for reading lamps. They come in two types: one giving the 'cool white' light, like the common bulbs, and the other having the warm light. As substitutes to the prevalently used bulbs, CFLs are available in various sizes and shapes, and produce warm light similar to that produced by an incandescent bulb. 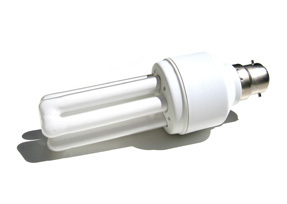 Earlier, CFLs were larger than ordinary light bulbs. Now they are getting smaller and fit in most light fixtures. Newer models are fitted with electronic circuitry, making them lighter and more compact. CFLs use only up to one-fourth to one-third of the electric requirement of incandescent bulbs while having ten times the life of the latter. Their regular use can have tremendous environmental benefits. Since electricity is usually produced from coal, and each CFL cuts down carbon dioxide emissions by about 1,300 pounds over its lifetime, using CFLs amounts to a lot of energy savings in the environment. Avoid turning off the bulbs too frequently as that shortens their lifespan and wastes energy. Check the packaging to learn about the intended functionality of the bulb and use it accordingly. If you use a CFL that does not work well in conditions of high heat or humidity like bathrooms, then you will not get the maximum output from your CFL. Using dimmers is a very effective way to reduce power consumption for all bulbs. Look for appropriate certification products for guaranteed quality and performance.